The rapid changes in technology have improved our living styles. One such improvement has been in the way we carry and keep our luggage safe. From old-fashioned name tags to latest luggage trackers that keep your luggage safe and away from the perils of being lost. A luggage tracker is a device that keeps track of the exact position of your gear and updates you about its exact location through a smartphone application or a webpage. A luggage tracker utilizes GPS, Mobile networks (GSM), Bluetooth, and Wi-Fi (rarely) technologies in order to track the exact whereabouts of your baggage. To help you select the best luggage tracker, here we are reviewing the top ten luggage trackers. It is pertinent to highlight that a considerable effort has been put into this review so you can choose the best product. The luggage tracker from Tile Mate is compact and handy that uses Bluetooth technology to track the position of your luggage. The Tile Mate can be easily attached to your luggage and anything else that you want to keep safe and know about its whereabouts. It has a convenient hole, perfect for attaching to your luggage items. The tracker works perfectly well with Android and IOS devices with Bluetooth 4.0 or higher. The largest tracking community of 5 million users worldwide formulates a lost and find network which can help you track your luggage if it is out of Bluetooth range and your stuff can be easily tracked while keeping your identity safe. 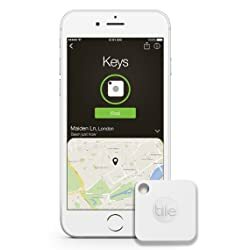 This device works through a beeping system, when you need to find your luggage, you can use the application on your phone and ring the Tile tracker attached to your luggage. The tracking device will start to beep and you can easily locate your belongings. The tracker keeps the record of the last position of your stuff, so you can easily find where you left them last time. Q: What is the cost of getting the battery replaced? A: The dead battery is replaced at about $15 after 1 year. Q: Is this tracker good only for finding items in the range or you can locate items out of the range? A: The Tile keeps the record of the last known position of your stuff and can help you locate items through its network of 5 million users worldwide. Q: How can the lost/find notification ringtones be changed? A: You can change the notification ringtones through the Tile application installed in your phone. There is no subscription fee; instead, you have to pay a minimal fee annually to get your battery replaced. One year battery life reduces the hassle of charging your battery and keeping charging adapters or spare batteries with you while traveling. Tile Mate can help locate your phone as well with its too way beep system. This is a multipurpose device and can be used to locate a lot of stuff other than your luggage. This product has generated hundred percent satisfaction levels and so far no issues have been reported. Spy Tech’s tracker is one of the best options to keep a check on your luggage. It uses GPS technology, Google maps and tracks record of your belongings in real time through the internet, no matter where they are. This tracker can easily be inserted into your luggage and you can use the application installed on your mobile phone. The tracker provides an update to the location every 5 seconds, so this can help you locate your important bags in case you miss them while traveling or get exchanged. The battery lasts for around 16 days and the built-in accelerometer help save the battery and thus you don’t need to charge it often, however you can recharge your battery once it dries out. The additional magnetic waterproof case will keep your tracker safe and work in case you are out there in a rainy season. The built-in accelerometer detects motion and automatically saves battery life when your luggage that has the tracking device is not moving. It has a geo-fencing option which can allow you to set parameters for your luggage; you can use this to avoid theft. The location of your luggage is reported in real time on your smartphone. Users report that this device gets hanged once in a while and the location freezes. 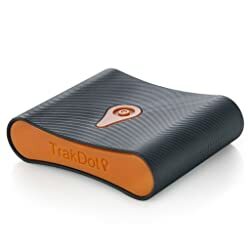 The Trakdot Luggage tracker comes with a 2-year warranty and uses GSM technology to locate the position of your luggage and informs the user through text messages and/or smartphone application notifications. The palm-size tracker can be kept inside your luggage without any hassle and keeps your vital gear safe while you are traveling. With an annual activation fee of $24.99, it has a battery life of 15 days and uses 2 AA size batteries. The batteries come with the package, along with a pre-installed worldwide SIM card and a starter guide. You can also connect multiple cell phones to one tracker and keep a check on the position of your luggage from all the connected smartphones. This device can work without an internet connection or Bluetooth. It is compatible with any cellular device worldwide. The AA batteries are easy to be replaced and you don’t need to worry about charging your device. The working of tracker may be hindered if the cellular network signals are not proper in a specific area. 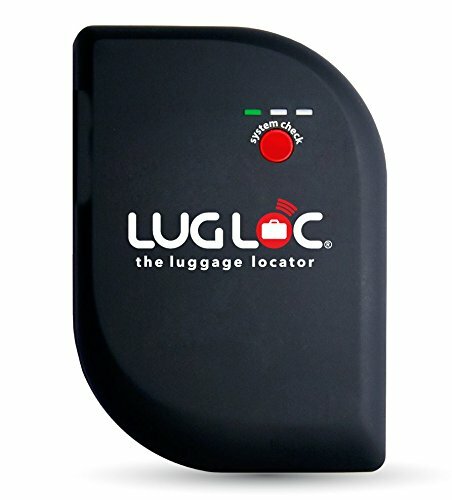 Using GSM and Bluetooth technology to provide enhanced protection to your luggage, the LugLoc tracker device has a battery life of 15 days which can be recharged. It uses the mobile phone application to show you the exact location of your luggage and text message alerts upon arrival. The smart size of this tracker can fit in any type of bag either it is a suitcase or a bag pack. There are no charges for your first thirty days use and then you will be charged as per your usage. The tracker is compatible with iOS and Android devices. It has a double layer of protection for your luggage and uses GSM and Bluetooth technology simultaneously to keep track of your luggage. The company is offering 30 days free subscription. The pay as you use plan is very suitable for people who travel less often. The customer service of this product is not user-friendly. Users report that GSM signal reception of this device is not up to the mark. The registration process with the company is tiring. 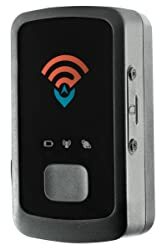 This tracker utilizes GPS technology and providing the option to track your luggage at intervals of 60, 30 or 10 seconds and has a battery life of around 8-10 days. The users are notified through a smartphone application and you can use this device to keep your mind free from the tension of losing your luggage while traveling. It costs around $25 per month. The device tracks your luggage when it is moved and keeps a track of the last location in case the tracking device inside your bags is turned off. The company offers a 2-months free service. The customer service is very helpful and friendly. The setting up of this tracker and synchronizing with smartphone application is very easy. The battery of this device is not durable and will not charge to a full hundred percent after using it for couple of months. The web interface of the company is a bit difficult to understand and operate for a common user. The location of the device gets stuck sometimes. Operated with the help of Bluetooth technology and having a battery life of about 1-month, this device is operated through a smartphone application and is compatible with both Android and iOS interfaces. The Bluetooth technology can be used to find the luggage inside a range of 100 feet and the community search to locate your belongings anywhere where nonda users are present. The device has no monthly subscription and comes with one year warranty. The micro USB cable needed to recharge the device is included in the package. 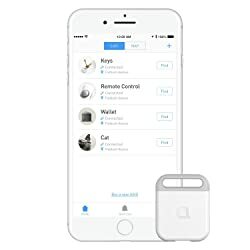 This device is also helpful in locating your lost keys and can also help you in finding your lost phone. The high pitch notification alarm from the device will help you locate your luggage when you are standing at a terminal and trying to find your bags from almost similar looking bags. The battery life of this tracking device is very durable and long-lasting. The rechargeable batteries avoid the replacement fee after a year or battery expiration period. The product sometimes indicates the wrong position of lost stuff. The smartphone application has a difficult interface and needs upgrading in order to make it friendlier and easy to use. The signal reception of the tracking device is very poor. 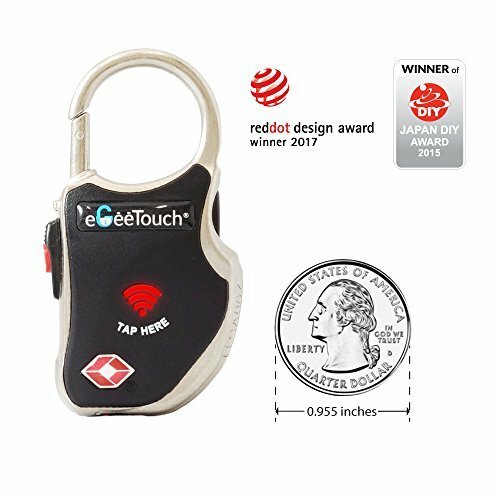 The tracker from eGee touch smart has a unique design and instead of a battery life being measured in weeks or days, it uses the lock/unlock cycles as its life period and has almost 4000 cycles, but the device still needs to be charged in order to ensure its proper locking and unlocking. It can be operated through Android/iOS smartphones, Apple watch, and Samsung gear. This tracker has a 1-year limited warranty. With subscription fee and an average usage of 3 years, this device uses encrypted IDs to keep your luggage safe from the danger of being lost or stolen. The tracker warns the user when the luggage gets out of a certain range by using wireless technology and is limited to the distance of 30 feet. It saves the users from subscription charges. Pairing option with Apple watch and Samsung gear is an added plus. The 4000 lock/unlock capacity does not mean that you do not need to recharge it; it still needs to be charged. It can only track luggage up to a distance of 30 feet. Users report that the overall durability of this product is not so great. 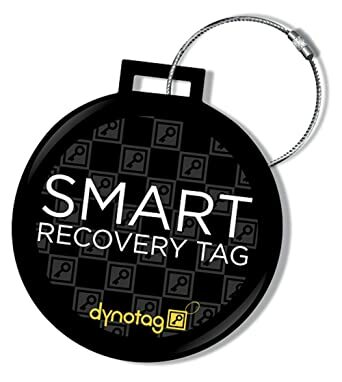 The recovery tag from Dynotag uses GPS technology and operates through the internet. It does not limit its users with a smartphone application, instead provides a private webpage that can be accessed anywhere from the world using the internet. Without any battery or electronic in the device, this waterproof and impact-resistant tag uses passive GPS technology to find the location of the luggage when the tag is viewed. With a lifetime subscription included in the purchase price, this device takes little effort setting up. The tag contains a QR code or a web address specific to the tag and only the user can access it. The tag only works when it is viewed. Though the user can see the location on the web page, it only works when the QR code on the tag is scanned. Lifetime subscription saves from the hassle of monthly or annual subscription charges. This tag system does not provide real-time location of the luggage, so in case of the luggage is lost; it is up to other people to actually see the tag, scan it and then the location will be uploaded. The tag gets stuck while showing the location of the lost luggage and indicated the same position. As advertised by the company, it has a diameter equal to baseball ball and it does not look good on your luggage. The second last tracker on our list is Bluetooth operated luggage finder. With a battery time of almost 100 days, it can track your luggage in the range of 80-120 feet using Bluetooth and beyond range the Nut lost/find community will help locate your luggage, keeping your privacy intact. It works through a two-directional beep system and you can use your Nut device to find your cell phone as well. It is compatible with iOS Android system and your smartphone must have Bluetooth 4.0 or above. The tracker has the ability to beep automatically when the luggage goes out of the range, so it can be used to avoid theft of your important stuff. Despite the manufacturer’s claim of 100-day battery, the battery dries out pretty soon. The Bluetooth reception of this tracking device is very poor and it keeps on disconnecting every now and then. The design of this device makes it difficult to attach with bag packs and suitcases. The Keynice tracker uses GSM and GPS technologies to help the user in finding the lost luggage, operated through a smartphone application, this device has a built-in rechargeable battery and can provide a backup of 100-hours once it is fully charged. It has a remote voice monitor, which can help the user to listen to the voices around the device. The battery timing of this device is very poor, users report that even after charging it overnight, the tracker shuts down in 4-5 hours. The setting up of this device is very difficult and lack of proper instructions makes it more gruesome. The customer service is very pathetic. Users have to buy a separate SIM card for this tracker. After reading our review, you must be in a position to select the best tracking device for your all-important travel belongings, but we are summarizing the qualities that you may need in your tracker. 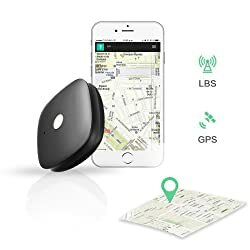 Tracking network – always chose the tracking network as per your needs, if you travel much around the globe regularly on a tight schedule, then you need a GPS tracker as you may lose your luggage and your next flight is ready. 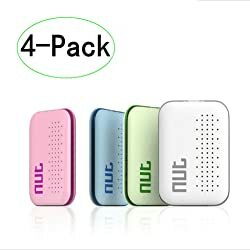 If you travel to areas or countries where your mobile network operates then GSM trackers are a good option for you and if you travel occasionally on an easy schedule then a Bluetooth tracker will work well for you as a hundred feet are enough to locate the position of your luggage at a terminal. Subscription and package – go through the subscription fee and other package charges that the service provider is charging. Carefully analyze how and what you will be charged for using the services. Battery – Consider the battery timing of the tracking device you are buying and how it is charged. Luggage tracker is a very useful device in the modern day. Not only it releases you from the mental tension of your luggage but also helps you in pinpointing your luggage when the terminals are overcrowded, keeps track of your luggage in worst case scenario of a theft of your luggage or exchange of similar bags and suitcases. Go ahead and select a suitable luggage tracker from our list and make traveling safe and relaxed.